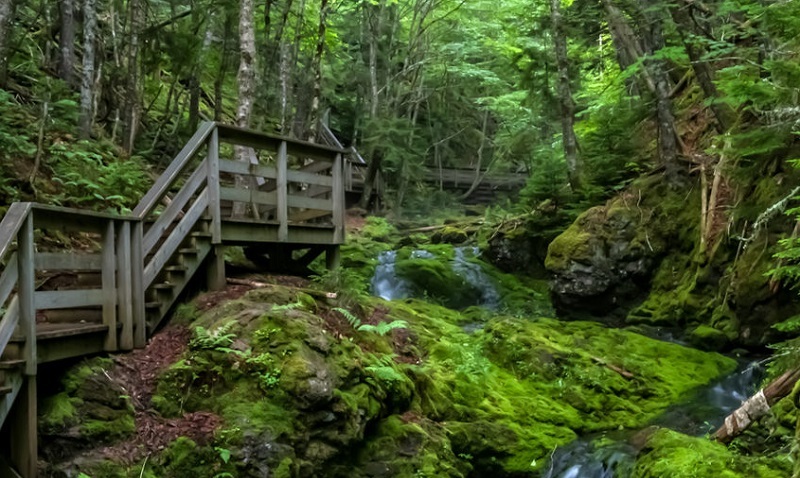 Fundy National Park in New Brunswick, Canada draws in thousands of people each year for it’s beauty and countless activities. It’s their 1st national park and although it’s smaller than most, it easily makes up for it in things to do. Within the park is also a heated saltwater pool which many campers enjoy after a long day of hiking or exploring. So kick back and relax before heading back to your tent, chalet, cabin, yurt, or RV. Reservations are always recommended when camping as spots can fill up quick. Most campgrounds allow reservations online and can become available months in advance. There are places in Canada that do offer random campsites, but unfortunately in the Bay of Fundy, camping is done in designated spots. You may want to bring a few pairs of hiking shoes for the 75 miles of trails. During your treks you can scale mountains, stumble upon beaches, or just stroll around and take in the wildlife. 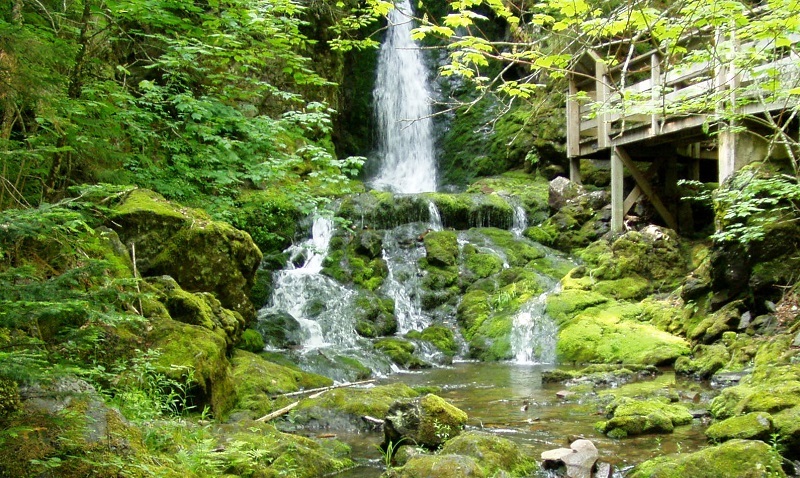 There are 25 waterfalls with picture perfect views to go along with some secluded streams. 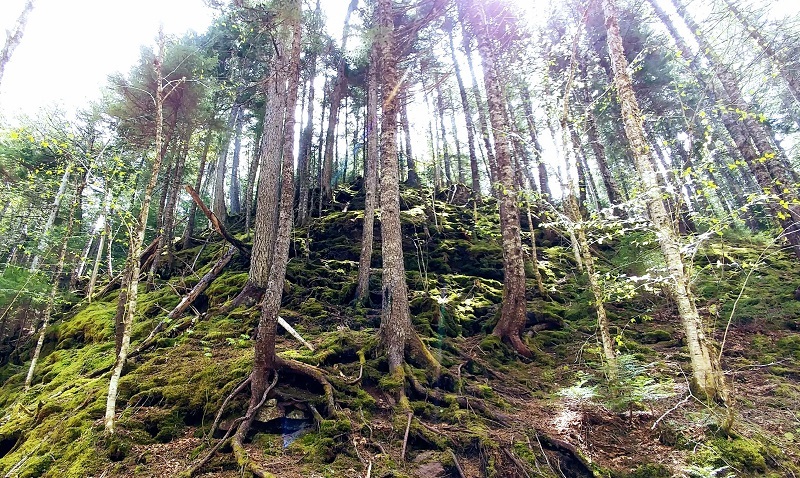 The Acadian forest is full of life and as you test your endurance hiking, make sure you stop every now and then to take in the sites. If you are lucky you may even find bird’s eye primrose, a rare plant that only grows here. Dickson Falls is the popular choice for hikers due to it’s scenic views of the park. 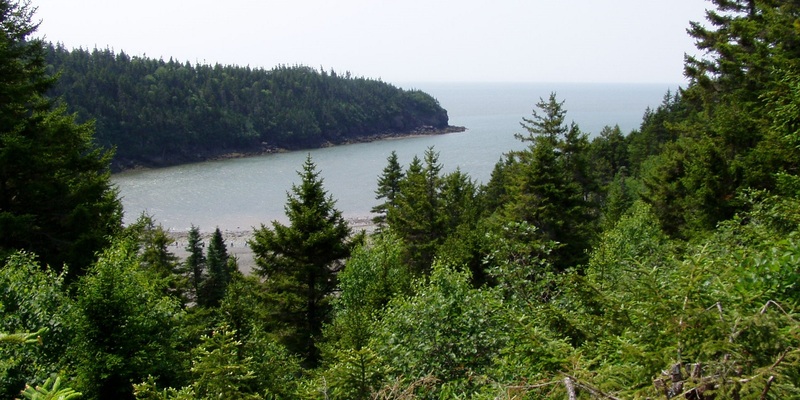 There are also guided tours through the forest that will go over the history of Fundy National Park and point out various wildlife and points of interest. It may take the fun out of hiking, but it will make sure you don’t miss anything. Caribou Plains Trails is another great hike that can suite any level of hiker. It’s roughly 2 miles long and passes a popular bog, beaver pond, and a large variety of plant life withing the forest. Outside of camping and hiking, there are plenty of activities for you and your family to enjoy. – There is a luxury golf course within the park that will challenge even the greatest golfer (9 Holes). – Several lakes offer activities such as boating, kayaking, fishing, canoeing, or swimming. 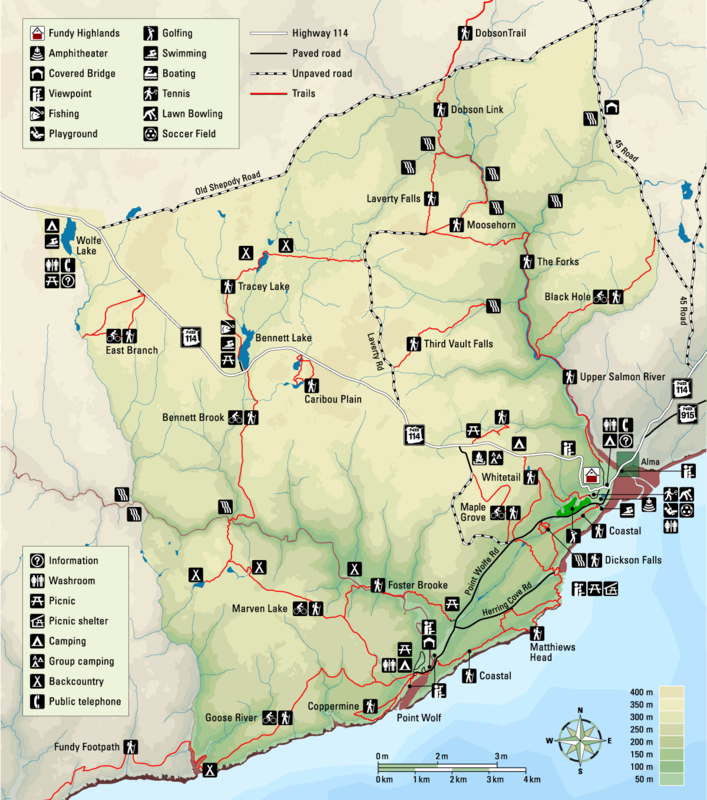 – Check out the Bay of Fundy to take in the sites of Cape Enrage, Hopewell Rocks, and Fundy Trail Parkway. – In the winter time you can enjoy some great cross country skiing with trails groomed regularly. Bay of Fundy also experiences the largest high tide in the world where almost 4 stories of sea water comes in. During the low tide visitors can walk around the ocean floor (known as the beach crawl) and find unique sea creatures and oceanic life such as dog whelk and periwinkles. It’s quite the scene to behold and if you can spend several hours here it will shock you to watch such the drastic change. Tours are available for this beach crawl and will give a good lesson on the different species that have to adapt to both being in water and then just air. The tides change twice a day so you will have plenty of opportunity to watch the water rise and fall. If you want exact times, it’s every six hours and thirteen minutes. There are many other things to do in Fundy National Park, but the unless you want to read a novel, we will leave it to the things mentioned above. 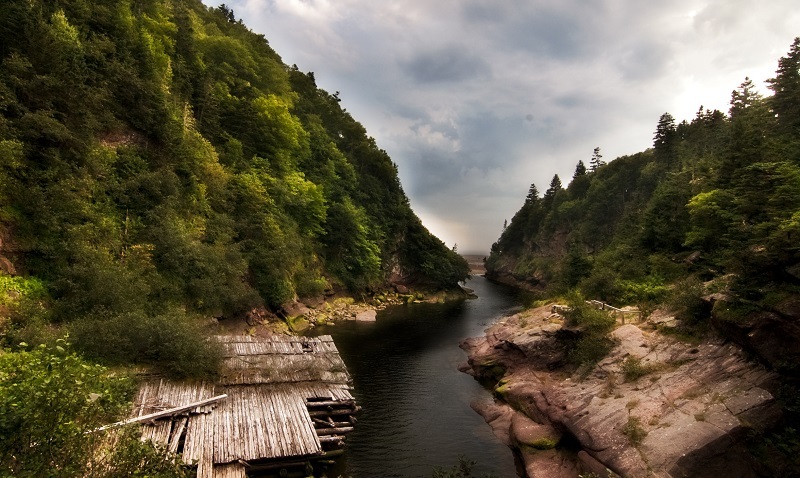 The next time you visit Bay of Fundy let us know how it went and any cool things you saw.